I only had an additional 10 days in China before returning home. What to do? The area I stayed in Kunming is on Green Lake that is surrounded by a big park. Large groups of people are doing Tai Chi, Qi Gong and aerobics to music every day all over the park. Most of the people were elderly and I wondered what it would take to see this many people doing exercise together in US parks. I visited Western Street with its French, German and English cafes indulging in overpriced meals. It may be the only place in town where you can get a real cup of coffee. Getting something to eat outside of Western Street was very awkward and uncomfortable. Proprietors act like they can't help even though I'm pointing to customer dishes giving the thumbs up to show what I want to order. Many times I got lucky and someone in the 'restaurant' spoke enough English to get a meal easier. There were a few ancient temples in town that I explored. I also wanted to visit some areas outside of Kunming. The Shilin stone forest looked really interesting. The issue for me was getting there. In other countries, hostels often set up tours making it easy for visitors to see the big attractions in an area. This is the second hostel I've stayed at in China that doesn't offer any tours. I figured out what bus to take and then had the front desk write out instructions for getting a taxi there. As I was heading out, I met a couple of young gals that were traveling together and invited them to come along. One gal had lived in Beijing for 18 months and knew the traps in taking a taxi. Unfortunately, she didn't speak any Chinese. Even though all the taxis have meters they won't use them. It's easy to get in a taxi thinking the meter is running. All fees have to be negotiated beforehand and even then the driver will often plead dumb. We let many taxis go until we got a reasonable rate. The bus was inexpensive and after an hours drive dropped us at the forest park entrance. One gal showed her library id saying 'student' and got a reduced rate into the park. I tried it but the ticket lady didn't bite. The Shilin Stone forest is really cool. At some point in history the area was underwater and formed amazing stone shapes. We walked through the park with a group of Thai monks that were super fun. Their saffron colored robes looked wonderful against the grey formations. The monks travel all over the world visiting temples. One monk had been living in Scotland and another was staying at a temple in North Hollywood, California. 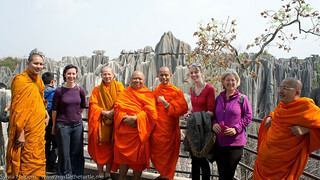 The monks made our walk through the Stone forest extra special. I had a good time with the young gals and we decided to continue traveling together to Dali and Lijiang for another five days. The hostel offered to take care of the stuff we didn't need and the trike while we were gone. We took a bus through the mountains to Dali which is very picturesque and photogenic. This was clearly a tourist town showing off 'old China' even though the buildings weren't old at all. Lots of locals walked around in beautiful traditional dress for the tourist's cameras. There were also touristic cafes to get a western meal. 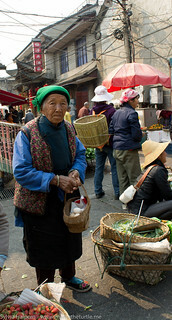 The morning market was my favorite with the brightly colored produce and interesting scenes. We stayed at the Emu Hostel run by a very nice Aussie man. There were travelers from all over the world. 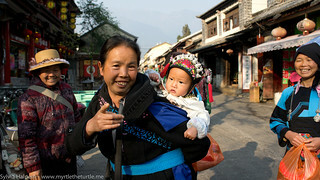 Next, the three of us took another bus further into the mountains to the town of Lijiang. 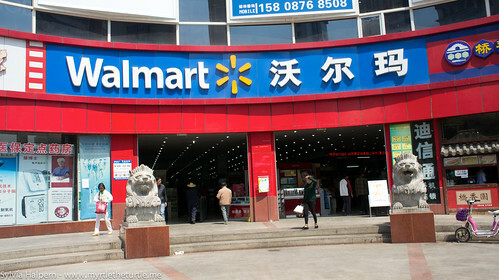 This town is the most popular tourist attraction for the Chinese people. It was crowded. Luckily, we had a reservation at Mama's guesthouse. The town is so touristic that it felt fake. 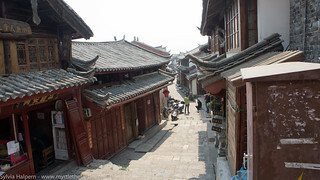 Old town Lijiang is built on a hillside and the streets were cobblestone. Again, this town was designed to look old. The buildings were mostly identical brown wood structures with red tile sweeping roofs. The town kind of had a Disneyland feel but I did have some authentic meals at a little hole-in-the-wall dumpling house. The gals went on a hike into the Tiger Leaping gorge for a couple of days while I stayed in the little town. My back was quite stiff and I worried the hike would push me too far. We took an overnight train back into Kunming and got a sleeping car with 6 bunks. 3 Chinese guys joined us in the car. They were so quiet I hardly knew they were there. I took an Ambien and managed to get a good nights rest. Smoking is allowed between cars and unfortunately our bunks were at the end of the car. The number of people, mostly men, that smoke in China is shocking. It's impossible to get away from cigarette smoke. I can only imagine cancer rates must be very high. Back at the hostel, I spent the last days packing and getting Myrtle ready for the flight home. Some guys helped me find foam when the extensive search for bubblewrap was a bust. A few days before I left China, I started reading a story about dead, diseased pigs floating down a river through the city of Shanghai. At first, there were a few hundred pigs and every day the numbers grew eventually getting up to 16,000. These were dead, diseased pigs floating down a river that supplies the drinking water for a city of 23 million people. The government response was always the same saying that everything was fine and the water was safe to drink. Unbelievable! By the time I was ready to head home my throat was very sore from air pollution. I'm not sure how much further I could have ridden had I stayed. The pollution levels would have only been worse as I rode north. Even though I'm leaving China much earlier than expected I certainly don't have any regrets. I'm glad I came and could see coming back - just not alone. It's a lot easier to keep a sense of humor during tough times with company. China is truely the strangest place I have ever visited. 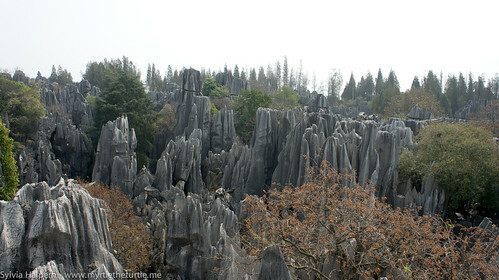 Dramatic landscape at the Shilin Stone Forest. Dali - love her little egg basket.